Boy Dog Names: Discover Hundreds of Puppy Names for Boys! Discover thousands of boy dog names to help you name your Cocker Spaniel puppy. Our comprehensive directory of puppy names will help to get your creative juices flowing. Simply scroll down to find something special for your new puppy. Discover thousands of boy dog names to help you name your new little pup. 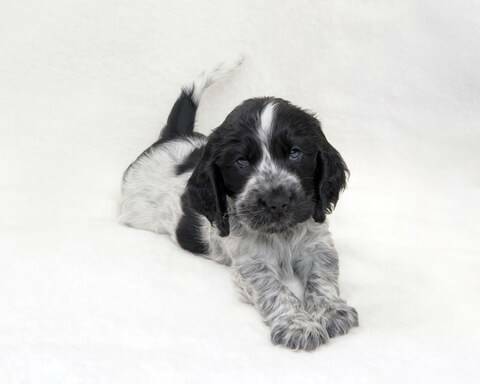 Simply scroll down to find something very special for your Cocker Spaniel puppy! You can scroll down the page and choose from a small selection of cute puppy names (listed alphabetically). Or, you can see a much larger selection of boy dog names by clicking on each letter of the alphabet at the bottom of this page. For example, if you click on the letter [A] below, you'll be taken straight to a page listing all boy dog names beginning with that letter - it couldn't be any easier! If you'd like some tips on choosing your puppy's name, either click here, or scroll down the page and you'll find some great ideas and suggestions to help you on your way. Good luck and happy browsing! Great Ideas for Male Puppy Names! Whichever puppy name you choose from the thousands available, try to select one that suits your little boy's personality. Choose something that's not too long; two syllables is ideal, for example, Jodie, Charlie, Jenson, etc. A shorter name will make it easier for you and your pup during training; he'll learn to respond to the sound of his name much quicker if it's short. Your dog's appearance or coloring could be your inspiration; for example, if he's is a golden Cocker Spaniel, why not choose Goldie, Sandy, Buttercup or Ginger? If your puppy's coat is black, what about naming him Shadow, Midnight, Ebony, Jet or Blackie? It's best if all members of your family are happy with your choice, and that they will be truly comfortable to use it in a public place - so involve everyone. I recommend you shortlist several of your most favorite boy dog names, make yourself a cuppa and relax, then consider each one carefully before making your final choice. If you're stuck, your puppy may be able to help you choose. Just call him to you using each name in turn from your shortlist and see which one he responds to eagerly. You never know, he just might like the sound of one of those puppy names better than all the rest! If you simply can't decide on just one name, why not put them all into a hat and let the youngest member of your family, (or Grandpa), draw out the winning name? Once you've chosen a winner from your shortlist, don't forget to keep using it so that your new puppy learns to associate the sound of his name with himself, for example, if you tell him he's a 'good boy', it would be better to say, 'good boy Jodie'. I hope you enjoy searching through our great selection of boy dog names and quickly stumble across something that suits your pup perfectly. Need More Names To Choose From? If you need more puppy names just click on any letter of the alphabet below! Like More Puppy Names for Boys?